Choosing a favorite dessert is tough. TOUGH I tell ya. But we must choose. You never know when you will be in some crazy situation where you only get to have one more dessert for the rest of your life, and you need to have an answer. For me, it's a very very close call between tiramisu and chocolate cake. 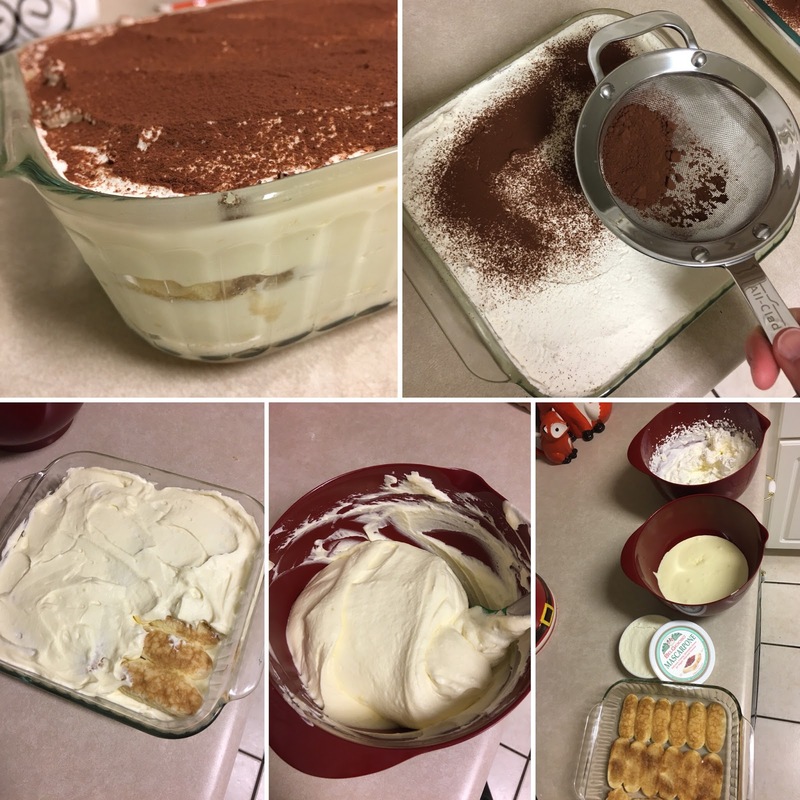 Two very different things, both super decadent, but in the end tiramisu wins out by a nose. My obsession is my mom's fault, or in a less negative way, she gets all the credit. She loves tiramisu too and from my recollection first encouraged me to try it at an Italian restaurant when I was a teenager. My first memory of it is during a quick trip we took, the two of us and a friend of mine, to Chattanooga when I was in high school. We ate at a local looking Italian restaurant, don't remember the name, and we all ordered it at my mom's urging. After that I was hooked! She's made it occasionally over the years and it's always excellent. This is the recipe she has used. Lately she has started making a Tiramisu mousse, which takes all the elements sans ladyfingers. 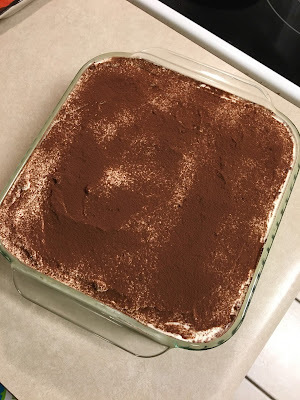 Now on to making a classic tiramisu! I skipped a few steps with my picture taking. First things first is really the toughest part, and it's not that tough. Make the egg yolk custard like stuff - Separate the eggs, whip with sugar, put it in the top of the double boiler, and cook for about 10 minutes. YOU MUST STIR CONSTANTLY. Don't stop stirring or you may curdle the egg yolks. That would be bad and you have to start over. When you are done, transfer to a bowl and cool to room temp. For me, by the time I brushed all the lady finders, whipped the first batch of whipped cream, the mixture was cool enough. (It's winter and my house is a balmy 67F degrees so that probably had something to do with it). The egg yolk mixture is pictured below in the middle. What dish should you use? I have used a trifle clear dish before, but mostly use my 8x8 glass pan. This recipe will be more than you can fit in an 8x8, so I'm using two of that size. You can certainly use a 9x13 glass pan too, but for me two smaller dishes is easier to put in the refrigerator. Below is the egg yolk mixture blended with the mascarpone, and ready for the whipped cream to be folded in. When folding in whipped cream, don't over mix!! 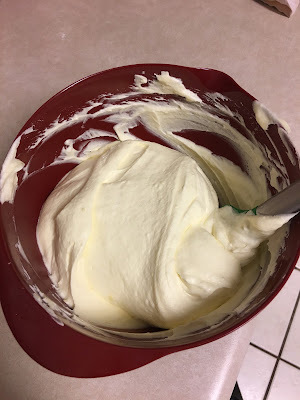 The key is you want to keep it light, and if you are too aggressive with your mixing you will flatten out all the nice air bubble you just created in the whipped cream. Also, don't fold it all in at once. I start out with a small amount, maybe 1/4 of it, then add the rest in thirds. It isn't exact science, so remember the key is to not over-mix. Now the layering begins. 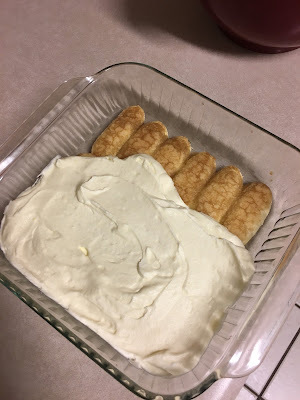 Layer on the cream mixture on top of the ladyfingers (that you have already brushed both sides with the coffee liqueur), then add another layer of ladyfingers, then another layer of cream. 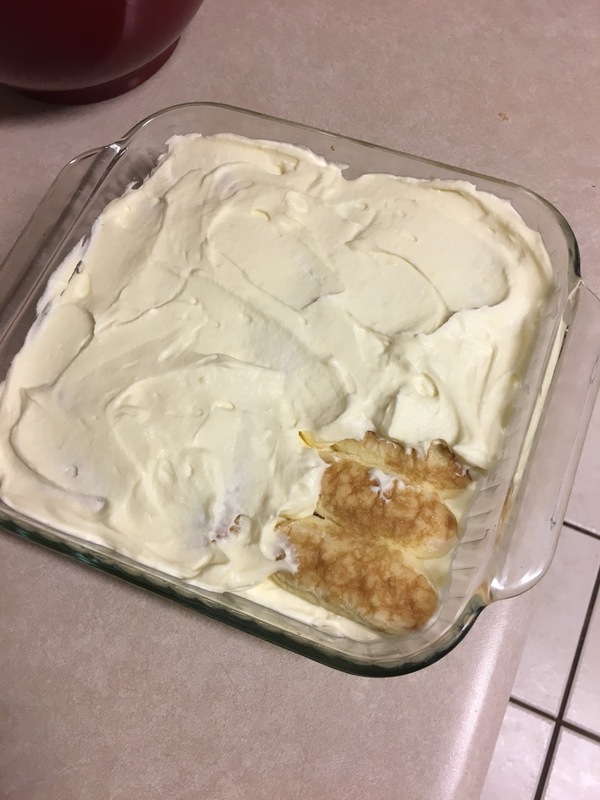 Leave some room at the top for the Sweetened Whipped Cream! Now add on your Sweetened Whipped Cream layer to the top. Watch out for others in your house that may want to come and steal the whipped cream as it's super delicious. I'm making this for a family get together, so plan to take the 8x8 pan and keep the other for myself. Hey, for all this work I need a reward, right? Dust the cocoa powder on the top. Word of advice, don't breath in deeply when doing this as you may sneeze, and that would be gross. See the little fine mesh strainer? It's new! Part of a 3-strainer pack I got for Christmas. LOVE THEM. Perfect for this! Oh, and the other good thing about making two dishes, is you can practice on the "keep" dish so you are better at it for the "share" dish. Combine egg yolks and sugar and whip until thick, about 1 minute. Place in top of a double boiler over boiling water. Reduce heat to low and cook 8 to 10 minutes stirring constantly. Remove from heat, transfer to a bowl, and let cool to room temperature. Add mascarpone cheese, beating well. Whip heavy cream in a separate bowl until stiff peaks form. Fold into egg yolk/mascarpone mixture; set aside. Brush each side of the ladyfingers with the coffee liqueur. Line bottom of a large dish or two small dishes with ladyfinder halves. (I used two 8x8 glass pans). Spoon half of the egg yolk mixture and spread evenly. Repeat ladyfinger layer then another cream layer. Spread sweetened whipped cream on top. Using a fine sifter or fine mesh strainer, garnish with cocoa powder on top. Cover and refrigerate several hours or preferably overnight. Combine 1/2 cup whipping cream, 1 tablespoon unsifted confectioners sugar, 1/4 teaspoon vanilla extract in a large bowl. Whip until stiff peaks form. Combine 1/3 cup hot espresso or strong coffee with 1 teaspoon brandy.